Hype! I'm gonna need a lot of these to complete my collection. 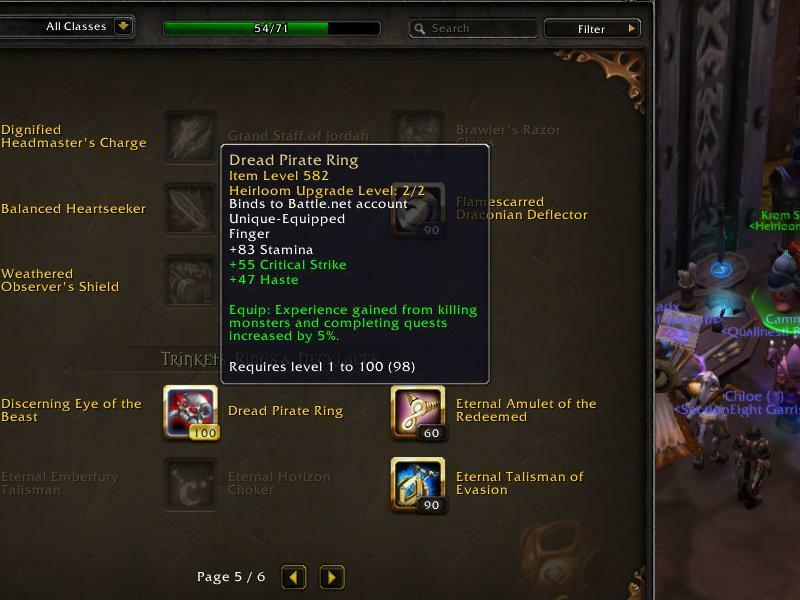 Hmm still nothing about upgrading Dread Pirate Ring. Sad day. While not listed on this item itself, these DO work on neck heirlooms, so its not a big leap to assume they will work on the dread pirate ring as well. Added in in 7.2.5, Weathered Heirloom Armor Casing - 2,000g from the Ironforge and Undercity vendors. In my opinion, price in Coin of Ancestry is bit too expensive, seeing as we can only get 84 coins per character per year, so any character that spends 10 coins or more on event toys/recipies can't buy it. You could say that price is aimed at people that have stored coins from previous years, but honestly, I can't see many people doing Elders just to stockpile Coins that, as far as they knew in past, were useless after you got everything. I can confirm as of 6.1 on live realms - This can be used on ANY heirloom that you have unlocked to level 90. Including the Dread Pirate Ring, trinkets, armor, weapons, etc. Enjoy! One of the tokens added with 6.1, which is used to upgrade all heirlooms (apart from weapons) to scale to level 100. It can only be used once as it is consumed when applied to an heirloom in your Collections tab. Note that while it is not included in the tooltip, you can also use it on rings and necklaces! It is permanently sold by Estelle Gendry (H) and Krom Stoutarm (A) for 2,000g and is also one of the rewards from a quest chain, which is given at lvl 100 by Drix Bassbolter (H) and Fix "Smallie" Biggswrench (A) at your tier 3 Garrison. - Lunar Festival: Sold by Fariel Starsong in Moonglade for 75 Coin of Ancestry. - Midsummer Fire Festival: Sold by Midsummer Merchant (H) and Midsummer Supplier (A) for 600 Burning Blossoms. - Hallow’s End: Sold by Chub (H) and Dorothy (A) for 450 Tricky Treats. - Timewalking events: Sold by Cupri (TBC), Auzin (WotLK), Kiatke (Cata) and Mistweaver Xia (MoP) - depending on event - for 1,000 Timewarped Badges. Even the tooltip doesn't mention rings, this works on Dread Pirate Ring, too! Does using one of these affect the heirlooms pulled from your panel or only the heirloom you use it on? Edit June 25, 2017: Huh, Blizzard changed the description on the item to make this clearer. I hope this comment was a factor in getting this done. I had two of these in my bag and when I used one of them to upgrade an heirloom armor, both of them were consumed. Really wishing Blizz would add these to the list of prizes at the Darkmoon Faire with Daenrand Dawncrest. "Only works on heirlooms that scale to 90". Does this mean that I first have to use an ancient heirloom armor casting first to be able to use this if I only just bought the original heirloom that only goes up to lvl 60? Enchant your heirloom BEFORE you use this, otherwise it won't be enchantable (for chest, shoulders, and pants) since those enchants won't work for item level 600+. Just got one of these in the mail from Johnny Awesome. I completed the new Postmaster quests yesterday (starting with Lost Mail), and today he sent me this mail! Cost reduced to 1000g in Patch 8.1.5, down from 2000g.